Student protesters look out from a prison vehicle as they are transported to a Letpadan court in March 2015. 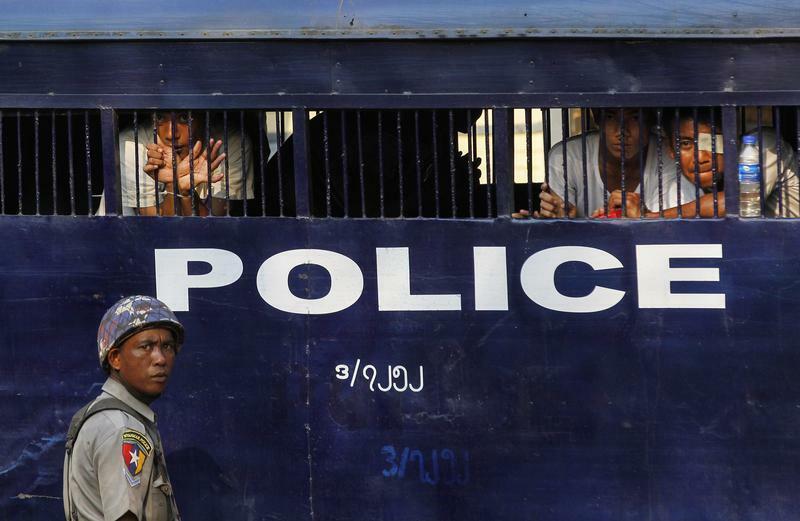 (Bangkok) ­– Burmese authorities should immediately drop all politically motivated charges against hundreds of detainees and unconditionally release them, Human Rights Watch said today. President Thein Sein should fulfill pledges he made over three years ago to free all of the country’s political prisoners. Many activists have been charged and convicted for violating section 18 of the seriously flawed Peaceful Assembly and Peaceful Procession Law, which requires prior police approval for public assemblies. - More than 50 Burmese students will again appear in court in Tharawaddy, Pegu Region on January 19, 2016, after being arrested in March 2015 following the police’sviolent crackdown on their protest over the National Education Bill. They are charged under several provisions of the Penal Code for rioting and abuse of officials; no police officers have been charged for unnecessary or excessive use of force. Authorities have brought the students to court more than 30 times since their arrest. The group includes prominent student leaders Honey Oo and Phyo Phyo Aung, both of whom were imprisoned previously for peaceful political activities. - Social worker Patrick Kum Jaa Lee who has been charged under section 66(d) of the Telecommunications Law for defamation connected to a Facebook post in October that allegedly mocked the military. He remains jailed without bail despite his declining health. Youth activist Chaw Hsandi Tun was sentenced in December to six months in prison for a Facebook post from October comparing the color of opposition leader Aung San Suu Kyi’s skirt with the uniform of the military commander in chief. - Interfaith activists Zaw Zaw Latt and Ma Pwint Phyu Latt from the Mandalay Interfaith Social Volunteer Youth Group were arrested in July 2015 and charged with offenses under article 17(1) of the Unlawful Associations Act as well as immigration offenses for visits they made to the headquarters of the Kachin Independence Army in 2013. Both face a prolonged trial, and many local activists believe the authorities are prosecuting them because of their efforts to promote religious tolerance among all religions in Mandalay. - Writer and former National League for Democracy (NLD) information officer Htin Lin Oo was sentenced to two years hard labor in June 2015 for allegedly insulting religion in a speech at a literary event in which he called for religion not to be tainted by politics. The ultra-nationalist Buddhist movement, the Association for the Protection of Race and Religion, or Ma Ba Tha, allegedly urged local officials to file charges against Htin Lin Oo. Three others were sentenced to two years hard labor in late 2014 on the same charges of insulting religion after posting an image of Buddha wearing headphones to a Facebook event page, which was deemed to demean the image of the Buddha. - Several journalists including the chief executive officer of the now defunct Unity news journal, Tint San, and four of his reporters, Yarzar Oo, Paing Thet Kyaw, Lu Maw Naing, and Sithu Soe, were sentenced in 2014 to 10 years for disclosing state secrets and trespassing as a result of a story Unity ran alleging the Burmese military was manufacturing chemical weapons. Their sentence has since been reduced to seven years. Prior to United States President Barack Obama’s visit to Burma in November 2012, President Thein Sein had pledged to free the remaining political prisoners throughout Burma. Soon thereafter, he formed a Remaining Political Prisoner Scrutiny Committee, which included government officials, parliamentarians, and former political prisoner advocates. The committee made considerable progress, and by early 2014 there were only approximately 25 political prisoners remaining behind bars. But that number soon grew again as the government arrested and jailed people protesting on land rights, education, and other government policies and actions. In early 2015, the government formed a new political prisoner review committee and appointed as its leader a hardline deputy minister for home affairs, an army general. The committee excluded former political prisoners working as rights activists. In January 2016, a senior official of the incoming NLD government, which won a landslide victory in the November 8 nationwide elections, pledged that their government would ensure there are no political prisoners during their term. The party also issued a definition of a political prisoner in order to guide decisions on releasing individuals from prison: a “political prisoner is anyone arrested, detained or imprisoned for their direct or indirect activities to promote freedom, equality, and human and civil rights, including ethnic minorities, as well as for involvement in anti-government protests.” The NLD has large numbers of former political prisoners among its members following decades of repression by the former military government. The party will come under intense domestic pressure to release all remaining political prisoners and rein in local officials who still target activists.